We were up early on another lovely blue sky morning. No packing up rafts after breakfast today, as it was time for a land-based side-trip - a day-walk up and out of the steep-walled and forest-covered valley to the open ridge-line, 1000m above us. 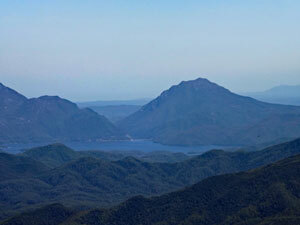 From there, we would get a 360° panorama of the wilderness, dominated to the south by the iconic peak of Frenchmans Cap. Thus, we soon found ourselves paddling the short distance across to the small sandy beach near Tahune Creek, on the opposite bank. Tying up, we headed up through a second campsite and then down to cross the forest-lined creek, clear water tumbling down its rocky bed. That would be the last "down" for quite a while. On the far side of the creek, a short steel ladder took us up the bank and into the verdant shade of the temperate rain forest. The first hundred metres of the climb out of the valley were very steep, with several sections of scrambling, where tree roots became a natural ladder. Beneath the damp forest canopy though, the cool morning air made for a pleasant climb as we pushed our way upwards past the odd giant eucalyptus. 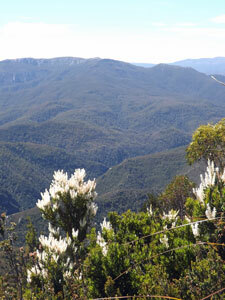 The slope gradually eased, enabling a steady climbing rhythm, up into more open eucalyptus forest, with a thicker shrubby ground-cover. 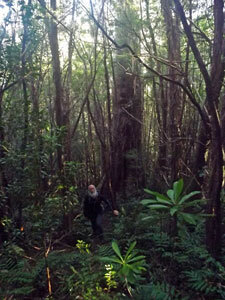 Eventually, we broke out of the trees and into the higher scrublands. 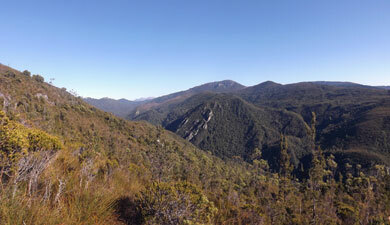 From here, we could look down onto the deep cut made by the Franklin River and the dark gap of Irenabyss. 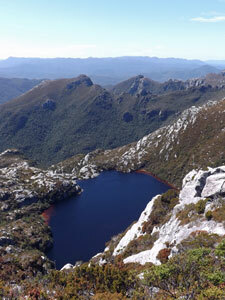 The Tasmanian wilderness lay draped over rise and valley like a rumpled green carpet. 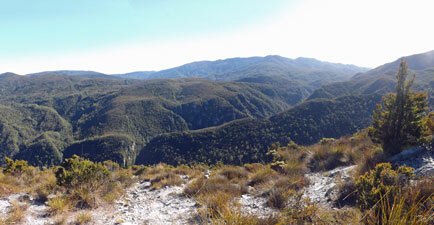 In the open, the warmth of the sun began to bite, as we continued our direct upwards assault on the ridge, reaching a small patch of scrubby forest, where the rutted, part rocky, part muddy track and overhanging branches slowed the walking down. 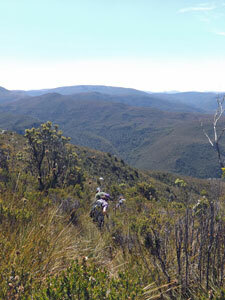 After a short passage beneath a rocky outcrop and another climb up through the scratchy scrub, we were out onto the ridge-line. 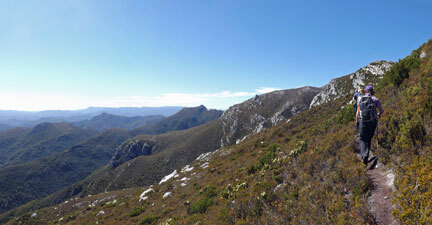 The ridge was exposed to a cold northerly wind and the walking was much cooler and much easier. 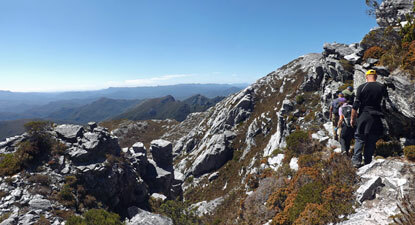 We followed the open ridge track, past red Christmas bells, pink-flowering trigger plants, white daisies and glistening sundews, as it led us across the quartzite plates, around rock outcrops and over barren quartzite knolls. 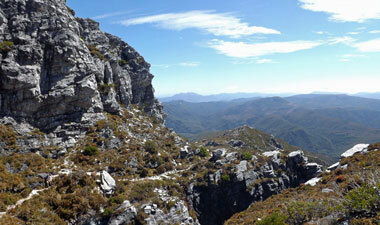 From one false peak, we could see the high-point of the ridge and, behind it, the unmistakable top of Frenchmans Cap. 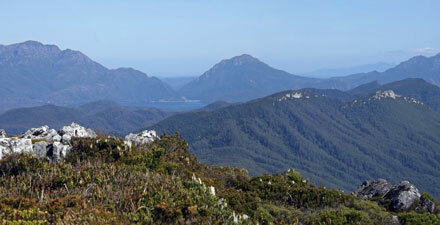 As we climbed the ever-narrowing ridge-line, views opened out in all directions - to the north-east, the blue silhouettes of Mt Ossa (Tasmania's highest peak) and Cradle Mountain (its best known peak), to the north-west, Lake Burbury framed by the mountains of the West Coast Range, and to the south-west, distant Macquarie Harbour, where we would emerge from our rafting trip in seven days time - superb. 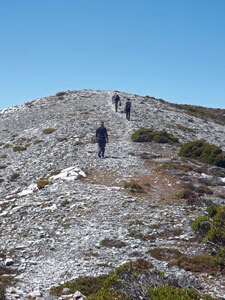 The climb continued around an impressive gap in the white-walled cliffs to gently stroll up a rounded stone-strewn dome - we had reached the point named Frenchmans Kneecap by some local wag. 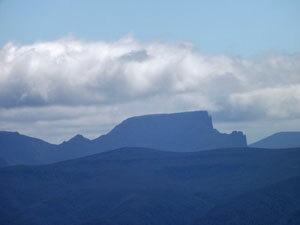 While clearly not as high as Frenchmans Cap a couple of kilometres to the south, the view of this grey-walled beast of a mountain was superb - Frenchmans Cap shows that you don't need to be high (only 1446m) to be impressive. As a bonus, the bright blue waters of Lake Nancy lay below us in a mountain hollow. 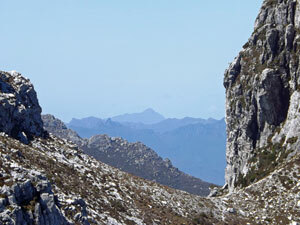 We headed down to Gunsight, a pass just below the Lions Head, and soaked up the superb mountain scenery over a long lunch in the lee of the wind. 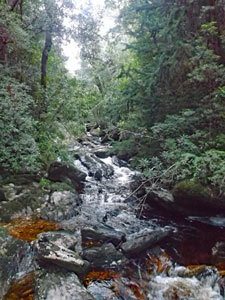 Then it was time to return by the same path. 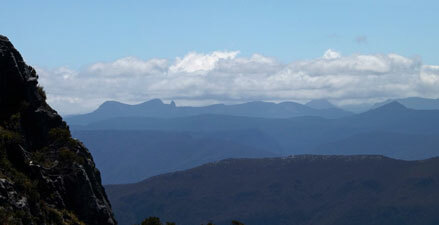 The track, however, was one where the return trip seemed totally different, as we walked towards the grand vista of the Tasmanian mountains and then down towards the winding course of the Franklin. 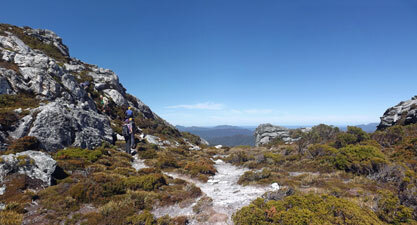 Once off the ridge, we were out of the wind and soon sweating freely in the warm sun. 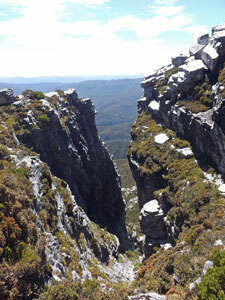 The descent itself was fairly relentless, with the occasional slip and slide on mud, wet tree root and loose leaf litter. Eventually, though we were back in the pleasant shade of the rain forest for the last steep descent, down root ladders and one last steel ladder to reach the sandy beach on the Franklin. After almost 1000m of continuous descent, our jelly-knees were grateful when we finally lay on the sand and listened to the river tinkling by. 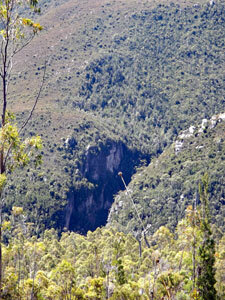 Thanks to Elias and Franzi for showing us the wilderness from above as well as below. Tonight we would have a good sleep and would need it, as tomorrow promised to be a big day on the river - and worse, 20mm of rain was forecast. It looked like our days of blue skies might have come to an end.